The beauty and property value added by your healthy, well-maintained trees is put at risk by every major storm that passes through as is the safety of your home in instances where a branch or even full tree falls. With so much at stake, it’s important to properly respond to your trees risk for storm damage in Chicago, IL both before a storm hits and after it passes. 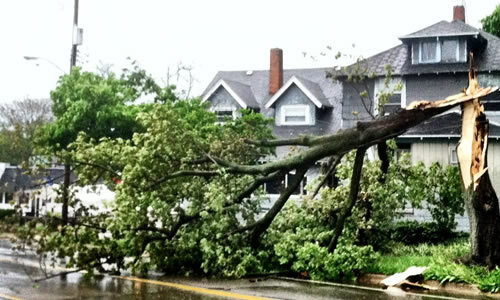 In both of these situations, having the knowledge, skill, and expertise of Arbor Tree Care’s tree storm damage Chicago, IL specialists at your disposal is one of the most surefire ways to protect the value, attractiveness, and safety of your property. Prior to a major storm there are a number of different tree services Chicago, IL homeowners can have performed by professional arborists to reduce the risk of severe storm damage in Chicago, IL. These include preventative tree pruning in Chicago, IL, proper mulching, and awareness of weak or diseased portions of the trunk and branches. Having professional arborists perform these tree services in Chicago, IL will greatly reduce the damage which strong winds, lightning, rain, snow, or ice can cause. After a particularly strong storm damage to Chicago, IL trees is very common. Fortunately with the help of the experienced arborists here at Arbor Tree Care’s Chicago tree care service, the beauty and strength of your trees can be regained no matter how much storm damage Chicago, IL trees have sustained. That said, depending on the scale of the damage which took place it may be more affordable and effective to perform tree removal in Chicago, IL rather than repairing the storm damage. In either case, the best way to determine the post-storm damage Chicago, IL services which are needed is to speak with trained, and highly experienced arborists from Arbor Tree Care. Contact our friendly Chicago tree care representatives today to arrange a free estimate.